Here is an article I recently wrote for the Climate Psychology Alliance website, calling the climate psychology community to action. I write this piece after my second week in my new job at the Technical Support Unit of IPCC Working Group II. 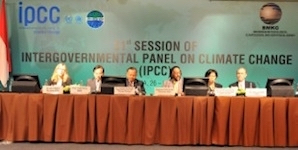 The reflections I offer are from a personal perspective, and should not be read as representing the views of the IPCC. I take a look at the position of psychology and psychosocial research in IPCC reports, drawing particular attention to a special report on 1.5 degrees, which is in the early stages of development. This report offers an opportunity to bring psychological dimensions of climate change mitigation and adaptation decision-making into the global frame where it has to date been largely absent. As Swim et al (2011) point out, “Although psychologists have been investigating climate change and related subjects for decades… the value of psychological contributions is not yet widely accepted, nor are psychological insights and findings widely applied” (p246). My analysis of a section of the most recent IPCC Assessment Report (AR5) bears this claim out, and I find it disappointing that not much seems to have changed since the paper was published (see also Clayton et al 2015). But we now have new opportunities to address this situation. As I go on to discuss, there are positive aspects that the climate psychology community can build upon – but it must act fast. From the perspective of climate psychology, the Fifth Assessment Report (AR5) is a significant development on AR4. I have not analysed the entire report but in the 1150 pages of Part A of Working Group II (impacts, vulnerability & adaptation) contribution to AR5 (IPCC 2014), psychology is mentioned 36 times and has its own short subsection in the chapter on Contexts for Decision Making. Now the references are brief and undetailed with psychology largely listed as a factor in decision-making or mentioned in terms of impacts of climate change (namely psychological distress), but the value of psychology is acknowledged, as for example in this statement: “Decision support must recognize that human psychological dimensions play a crucial role in the way people perceive risks and make decisions” (p852). As the climate psychology community is well aware, psychological dimensions interact with social factors and contextual forces in highly complex and often unconscious ways to shape cognition and behaviour. Developing understanding of the different types of psychosocial factors, how they influence mitigation and adaptation responses on cognitive, affective and behavioural levels, and how these factors can be strengthened (if adaptive) or inhibited/disrupted (if maladaptive) is vital for supporting adaptive action and for addressing social inertia. Simply informing people that these factors exist is an important first step just because so many psychosocial processes occur below the level of their conscious awareness. Making them visible by naming them enables people to make conscious adaptive changes to the way they respond to climate change and other aspects of ecological crisis, as well as enabling the design of more effective policy interventions. This is why it so important that psychology is included in the IPCC reports, and especially in the Summary for Policymakers (SPM) as that may be the only part of the report that policymakers actually read. However, in AR5 psychological/psychosocial dimensions are not mentioned in the SPM. I do not know the reasons for this, but the absence helps explain why the situation Swim et al identify is occurring: quite simply there is a self-reinforcing feedback loop in play – if psychology isn’t included in the Summary for Policymakers it is less likely to be accepted and applied by policymakers. Now the new cycle of work to produce the next assessment report (AR6) and a number of special reports presents us with new opportunity. This is within a broader context of a shift within IPCC to focus more on solutions, which is likely to bring more social sciences content in AR6 than previous assessment reports. The next scheduled report relevant to climate psychology is on 1.5 degrees (SR1.5), which is due out in 2018. This interdisciplinary report was invited by the governments coming out of COP21 last December. The background document prepared for the recent scoping meeting on SR1.5 has much to be excited about. I admit to being surprised about this. Reading it I was particularly fired up by points made about challenging scientific understanding beyond empirical evidence and underlying assumptions, drawing on different knowledge systems including learning from practitioner communities (and although not mentioned explicitly here but it is in AR5 – indigenous knowledge), looking at multiple ways to think of transformation and development, the emphasis on equity and ethical dimensions, and a call to maintain a holistic integrative systems perspective in the writing of the report. It refers to ‘psychological’ underpinnings of human responses, and ‘psychosocial’ is included as an area of expertise sought in participants of the scoping meeting. These themes will resonant I’m sure with many in the climate psychology community. A key topic is transformative challenges, which I see as the main area of contribution of psychosocial and climate psychology research. This is a topic that will become even more pertinent as we approach 1.5 degrees warming within the timescale of production of SR1.5, based on current trajectories. A comprehensive discussion of the psychosocial dimensions of mitigation and adaptation decision-making particularly in relation to maladaptive responses, and identifying pathways for overcoming social inertia and resistance, seems an important contribution that climate psychology can make to this report. The next stage is for governments to reach consensus about the content of SR1.5 and for experts to be nominated as authors for the report. Work on AR6 will also soon start; experts will be nominated to be participants in a scoping meeting. Now is the time for the climate psychology community to step up and make its presence felt in order to ensure that psychosocial dimensions are represented in the main body of SR1.5 report and in the Summary for Policymakers, as well as in AR6. There is a small window of opportunity because the schedule for SR1.5 at least is quite tight. There are a number of ways to get involved: getting nominated as an author or review editor, or sign up as an expert reviewer of the report. You can also alert those who are selected as authors to your published work so it can be cited in the report. New papers must be submitted for publication by October 2017 and accepted by April 2018. Organisations can also apply to be listed as an ‘observer organisation’ with the IPCC. This status entitles the organisation to nominate authors. Due to the time it takes for organisations to be approved, organisations starting the process now would not be ready to nominate authors for the special reports but they could for AR6. Another opportunity is the expert meeting on the science of science communication that is planned in 2018. This will bring new AR6 authors together with climate communications experts, to sensitise authors about the psychological and sociological aspects of climate communication. To end I wish to mention a further positive development, which is the new post that has been created in the Technical Support Unit of WGII for a specialist in psychosocial research on climate change mitigation and adaptation decision-making. Through a most serendipitous route, I am now employed in this science officer post, where I can draw on the knowledge gained through doing my PhD research on psychosocial factors affecting enactment of pro-environmental values. It is a junior role with a limited sphere of direct influence and with no research or authoring remit but the fact that I am here at all I find quite amazing. Perhaps it is a sign of desperation of climate scientists that despite all the facts and figures they work so hard to produce, societal inertia is a still a major factor hindering our progress in responding adaptively to the life-threatening situation we have ourselves created. In this article I have already mentioned disappointment, surprise, amazement and excitement in my new job; I think I would be wise to also expect frustration and despair. But for now I feel encouraged that psychological/psychosocial dimensions of human experience are being brought into the IPCC conversation. The challenge for the climate psychology community is to make sure these aspects are developed in ways that can support the design and implementation of ecologically adaptive policy and socially just decision-making. For more information about the special report on 1.5 degrees and to view meeting documents visit http://www.ipcc.ch/report/sr15/. The form to apply for observer organisation status is at http://ipcc.ch/pdf/ipcc-principles/ipcc-principles-observer-org.pdf Information about IPCC process is on the main site. Gallery | This entry was posted in Uncategorized and tagged climate change, ecopsychology, leadership, policy, psychology, research. Bookmark the permalink. Congratulations on your new post Nadine and your insightful work – look forward to hearing more.